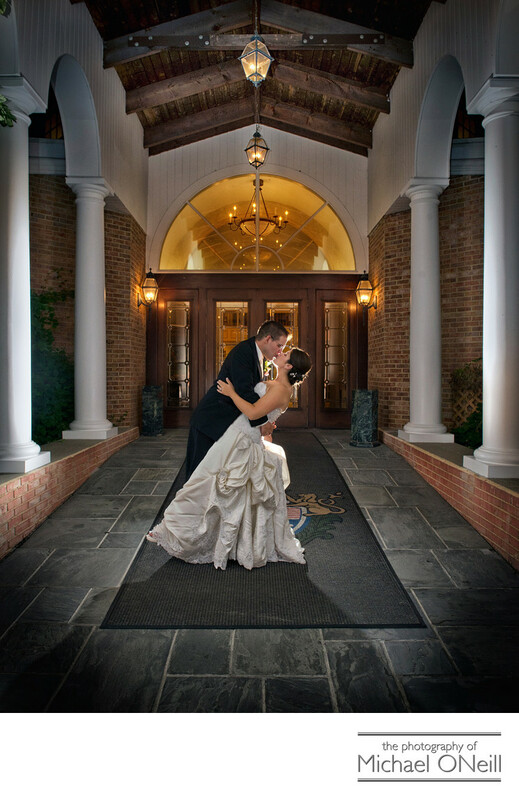 This wedding pic was taken at night in front of the grand entry to the clubhouse at The Hamlet Golf and Country Club in Commack, NY. Former home of The Hamlet Classic championship tennis match The Hamlet offers one of the most elegant country club atmospheres anywhere for a wedding reception. It’s elegant ballroom is huge and beautifully appointed. When your guests enter they are greeted to a two story tall lobby surrounded by an overlooking balcony and a magnificent fireplace. The manicured grounds outside are overlooked by a raised patio where outdoor cocktail hours are hosted and serve as the perfect backdrop for stunning wedding photographs. Elsewhere on this web site you will find other pix created at the Hamlet including beautiful sunset images taken by the large pond just outside the clubhouse doors. The Hamlet is located less than ten minutes from my East Northport, New York studio and I have many opportunities to garner experience creating beautiful wedding pictures at this venue. If you are planning a Hamlet wedding drive ten minutes north and visit me at my gallery. I would love the opportunity to work with you at your Hamlet event.